This website was created by PoiesisCreations LLC to present a new concept of education that should permeate all levels of Education from pre-K to 20: click here Education with depth and wisdom, in close connection with the current needs of our societies, world and planet. https://deluxestorehq.com/rilsk-zakladki-v-nalichii-amfetamin-boshki-kokain-spais-ekstazi-mdma-gashish-geroin-mef-mefedron-skorost.html The concepts of Deep Approach to Language Learning, Deep Education, and Deep Institute were developed by Dr. Francois Victor Tochon. Dr. Isabelle Druc Tochon created the section of the website that presents original videos for language learning and learning ceramology. Now Dr. Druc Tochon has a Vimeo channel where some of her videos can be watched. During his Summer breaks, Francois Victor Tochon started creating online courses on the website, courses that met the purpose of Deep Education. The number of visitors to the website increased. Dr. Tochon proposed a revolutionary concept of a university that would propose https://nicedugshq.com/ruzaevka-zakladki-v-nalichii-amfetamin-boshki-kokain-spais-ekstazi-mdma-gashish-geroin-mef-mefedron-skorost.html academic programs on demand, created by the students with a template format. Deep Institute was born. Many pages on the website present this concept and the way it can be organized. At some point, the website and the concepts proposed by Francois Victor Tochon attracted the attention of members ofa philantropic organization, the Lions Club International (LCI). 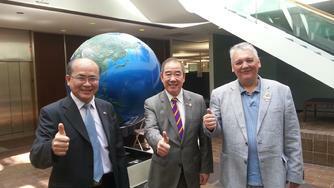 Directors of the Lions Club International Foundation visited Dr. Tochon. In June of 2014, Dr. Francois Victor Tochon, designer of the concept of Deep Approach, Deep Education and Deep Institute was awarded the Medal of the 2013-2014 Council Chairperson of the Lions Club International in Taiwan for his contribution. In August 2014 he was invited to the International Headquarters of the Lions Club International in Oak Brook and received the Lions Quest and LCIF Badges of the Lions Clubs International, Illinois, USA, for high contribution to Academic Affairs and Humanity. On August 12, 2015, Dr. Tochon received an Honor from the 2015-2016 International President Jitsuhiro Yamada of the Lions Club International. 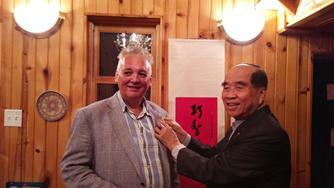 The Badge given on behalf of the LCI International President honors Dignity, Harmony and Humanity. Some lions leaders of the Lions Club International (LCI) consider that the goals of Deep Institute coincide with the goals of LCIF to help youth internationally acquiring world-related knowledge and wisdom. A Board of Trustees is being created to implement Deep Institute mini-campuses in various countries, as well as inter-university agreements to support resourceful connective mass online open courses (cMOOCs). The mini-campuses will provide transdisciplinary cMOOCs to small teams of students who use these resources to create new, project-based knowledge leading the way toward a world guided by integrated science and wisdom. Deep Institute online programs are in preparation. https://nicedugshq.com/kologriv-kupit-kokain-geroin-mdma-ekstazi-mef-mefedron-amfetamin-gashish-shishki-boshki.html Dr. Yuangshan Chuang is the Secretary General of theLCI’s Past International Directors’ Joint Office in Taiwan. He has been elected by the Board of Trustees of Deep Institute Inc. for the years 2015 and 2016 as International President of Deep Institute over the setting of international Deep Institute campuses, under purview of Dr. Ching-Li Lee, the current LCIF Steering Committee Member. There are only 16 steering committee members appointed from 209 LCI member countries and only 17 international directors elected each two years also from the 209 LCI member countries. The purpose is to make Deep Institute affordable and available all around the world. The Board of Trustees welcome proposals to create mini campuses in any country. There is a Contact form at the bottom of this page. On November 26 of 2014, 124.48 acres (52 hectares) have been acquired in Wisconsin, USA, to build the first mini-campus. Another terrain of similar size has been prospected in Queensland, Australia. Negociations are made to implement other mini campus near Granada, in Spain, and in Guilin, China. The 2nd, 3rd, and 4th floors of a nine-story building in the center of Kaohsiung, Taiwan, have been reserved for Deep Institute coordination. So far the Presidents and Trustees of various universities have expressed interest in creating and benefitting from Deep Institute cMOOC programs and concepts. A partnership is being negotiated with the coming Laozi University in Luyi County, Henan Province, China. Honor from the 2015-2016 International President Jitsuhiro Yamada of the Lions Clubs International, awarded by Dr. Ching-Li Lee.